Savard's second concussion in 10 months has ended his season after just 25 games. Earlier today, the Bruins confirmed almost everyone’s suspicions that, indeed, Marc Savard will be shut down for the rest of the season after receiving his second concussion in 10 months. Savard has been out since he was hit by Matt Hunwick on January 22nd in Colorado. Savard had never really regained his form since his concussion by the hands of Matt Cooke in March. Savard had just 10 points in 25 games this season. Savard looked much like he did in September’s press conference, which is to say, unwell. 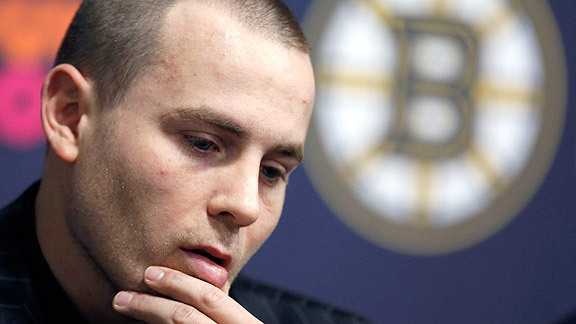 Savard appeared pale, gaunt, and generally out of it at today’s press conference. Savard will return to Canada to rehab and get well and said he will visit Boston often during the season if he can. The announcement to end Savard’s season does give the Bruins $4 million to work with in extra salary cap space, which will give the Bruins some wiggle room as the February 28th trade deadline creeps nearer. When asked, Peter Chiarelli said that the Bruins would “be busy” from now until the trade deadline, perhaps looking for a piece in lieu of Savard’s season ending. Chiarelli said that P-Bruins will get the first chance at filling the void but I still expect the Bruins to look for an expiring contract to add some forward depth down the stretch. Speaking of P-Bruins, the Bruins brought up Jordan Caron to take Savard’s roster spot following Zach Hamill‘s promotion in lieu of Daniel Paille‘s suspension. The moves seem to be tryouts for the young players and perhaps a showcase for Hamill as potential trade bait. The moves also mean that Tyler Seguin could see less playing time than even now. Then again, the rest of the month could be a tryout for a lot of players as Bruins management figures out how to replace Savard’s presence on the team whether it be from within or from the outside.